Standard size 500x700mm, 600x800mm, 700x900mm. 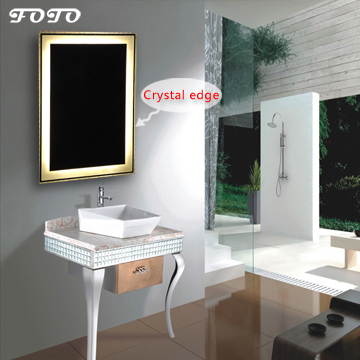 • Mirror - 5-6mm environmental silver mirror, automotive grade float glass, copper free and lead free, anti-corrosion, fingerprint-free. • Lighted Box - made of Galvanized sheet Iron & White Baking Varnish Painting, well protected against dampness and corrosion. • Lamp - High output 2835 SMD LEDs, 3 chips, 120 LEDs/meter, 20-24lm/pc, CRI>80, ideal for makeup application. Colour temperature 3000K / 4000K / 6400K available. Energy saving and long life of 50000 hours. • T5 or LED is available. • LED Driver / T5 Ballast - Built-in MEAN WELL LED driver or T5 ballast, UL / CE certificated. • IP44 rating, suitable for using in luxury hotel bathroom area 2. • UL, ETL, CETL, CE, RoHS certificated. • Packing: PE bag + all around Polyfoam + Earth carton + Carton box, 1 pc/ctn; Wooden Case for LCL or if necessary. • Production ability: 6000pcs per month. • Quality Warranty for 3 years.